7 BAER’S POCHARDS (5 males, 2 females) at Hengshui Hu (TT, TB). An interesting time to visit. At this time of year the birds are in eclipse plumage and, of the males seen on 21st, none appeared to show any green on the head. See the short video clip below of one of the birds. 1 male at Wanping Hu, Beijing (PH, HH). An unusual breeding season record in Beijing. 6 BAER’S POCHARDS (3 pairs) at Huairou Reservoir, Beijing (TT and Ben Wielstra). A record 308 BAER’S POCHARDS at Hengshui Hu plus at least 5 presumed BAER’S POCHARD x FERRUGINOUS DUCK hybrids (TT). Some video of some of the presumed hybrids below. Note the atypical flank pattern, chestnut on the head and more Ferruginous-like head and bill shape. Comments welcome! And here some video of a female BP and another female, possibly a hybrid, seemingly paired with a male Ferruginous Duck. 4 BAER’S POCHARDS at Yeyahu (TT, ZM, HH et al). 3 BAER’S POCHARDS, Yeyahu (TT, BE, RH). 142 BAER’S POCHARDS (112 males, 29 females) at the breeding site in Hebei Province (PH). Talking Naturally podcast about BAER’S POCHARD with WWT’s Rich Hearn. 14 April 2016: 83 counted at a lake in Jiujiang, Jiangxi Province. 6 at Miyun Reservoir before the observer was ejected by police. 23 March 2015: 8 at the breeding site in Hebei Province (JY). Also 1 male at the Summer Palace (JH). Still there on 24th. 4 May 2014: at least 24 Baer’s Pochards at the breeding site in Hebei Province, with many displaying. 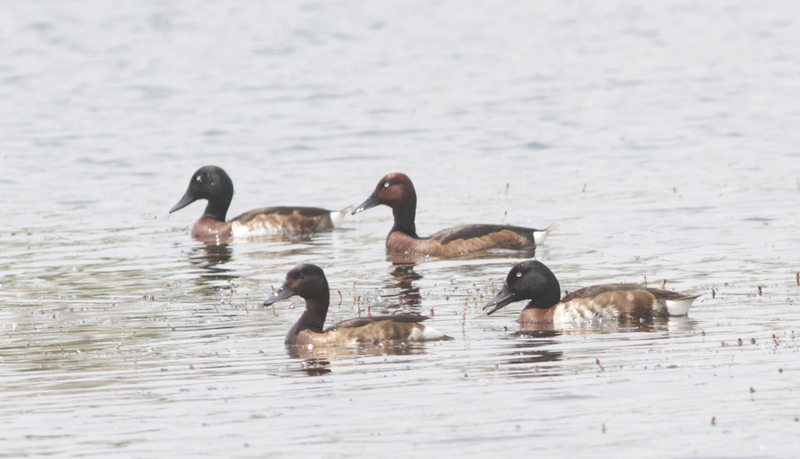 BAER’S POCHARD (Aythya baeri), 2 males (upper left and lower right) and a female (lower left), with drake FERRUGINOUS DUCK (Aythya nyroca) on the breeding grounds in Hebei Province, May 2013. Baer’s Pochard (Aythya baeri) hit the mainstream birding headlines in Europe when British birder, Alan Lewis, famously ‘twitched’ one in Japan in February 2012. The fact that Alan was prepared to fly half way around the world to see a single overwintering drake a few hours from Tokyo was testament not only to the rarity of this once abundant duck from East Asia but also that, at the time, there were no reliable sites to see it in the wild anywhere on the planet. In the early 1900s Baer’s Pochard was described by La Touche as “extremely abundant” in eastern China during spring and autumn migration as it made its way to and from its breeding grounds in northeast China and southeast Russia. Some recently circulated notes from Beijing-based Jesper Hornskov described a flock of 114 on the lake at the Summer Palace as recently as March 1989. Many birders who visited the Chinese east coast migration hotspot of Beidaihe in the 1980s and 1990s probably saw reasonable numbers, too. Historically, it was reliable in winter at Poyang Hu in Jiangxi Province, with flocks numbering 100s of birds being reported there as recently as the 1990s and 2000s. However, its decline since then has been dramatic and near catastrophic. In 2012 a (partial) summer survey of what was thought to be its breeding stronghold – Lake Khanka on the China-Russian border – produced not a single confirmed sighting during the core breeding season, although two were seen in August. Similarly, a 2012/2013 survey of its known core wintering grounds, coordinated by WWT and WWF China, produced just 45 individuals thinly spread across the Provinces of Anhui, Henan, Hubei, Jiangsu, Jiangxi, Sichuan and Hong Kong, an apparently calamitous drop in numbers that explains why the status of Baer’s Pochard was rightly upgraded to “Critically Endangered” by BirdLife International. In fact, the expansion of the range of Ferruginous Duck could be an additional threat to an already vulnerable Baer’s Pochard due to the spectre of hybridisation. The threat of hybridisation is not just theoretical; it’s real. I have personally seen drake Baer’s Pochards displaying to female (and male!) Ferruginous Ducks at Wild Duck Lake in Beijing and one bird I observed on the breeding grounds in May showed characteristics of both species. The image below shows a bird that, superficially, looks like a Ferruginous Duck but the heavier bill and the green sheen to the nape may indicate Baer’s influence. 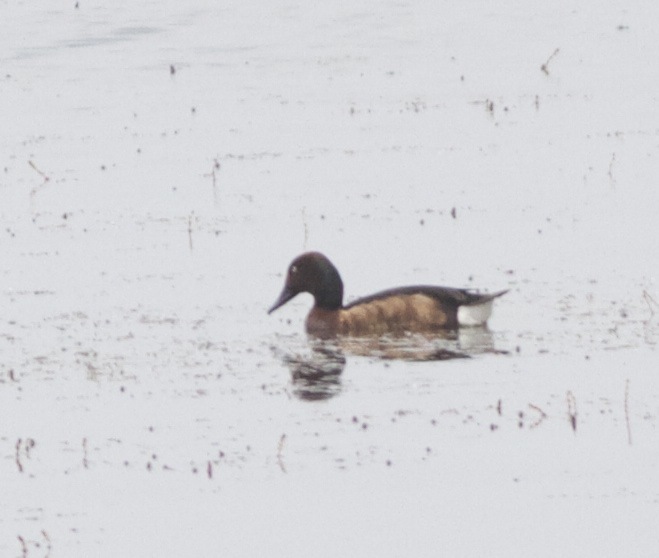 And, according to Nial Moores, Director of Birds Korea, “obvious” (probably Baer’s Pochard x Ferruginous Duck) hybrids are reported to be commoner than pure Baer’s in Korea and Japan. Possible Baer’s Pochard x Ferruginous Duck hybrid, Hebei Province, May 2013. Note the more Baer’s-like structure and the green sheen to the back of the head/nape. It’s perhaps not surprising that Baer’s Pochard was top of my “most-wanted” list when I arrived in Beijing and I will never forget the elation of self-finding my first drake in March 2012 on a central Beijing reservoir. 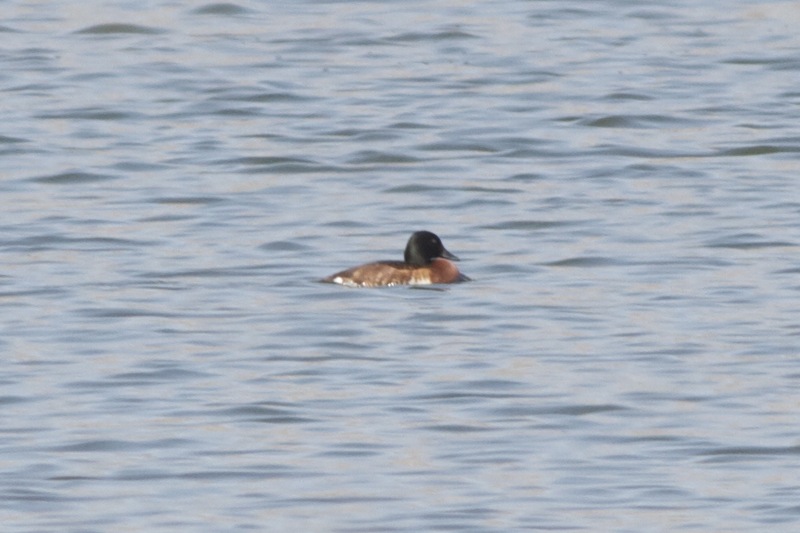 My first BAER’S POCHARD, a drake at Shahe Reservoir, Beijing, on 25 March 2012. However, among all the doom and gloom for Baer’s Pochard is a glimmer of hope. In 2012 a breeding site – the only confirmed breeding site currently in existence – was discovered in Hebei Province – well south of Baer’s Pochard’s traditional northeast Chinese and Siberian breeding range. According to local birders, at least four pairs attempted to breed last year and young were seen in July. Breeding has also been suspected or reported (but as yet unconfirmed) at two other sites in Shandong and Henan Provinces, again well south of the traditional breeding range and involving just 1-4 pairs. Whether these sites have always held Baer’s Pochard and have simply been overlooked in the past, or whether Baer’s Pochard is a recent colonist at these more southerly sites is a question to which we don’t yet have the answer. If it is a recent colonist, could it be an adaptation to the deteriorating conditions on its traditional breeding grounds? And given that Ferruginous Duck is also a breeder at these sites, is hybridisation now the most immediate and pressing threat to this species in the wild in the same way Ruddy was a threat to White-headed Duck in Spain? With such a small wild population, birds in wildfowl collections and the quality of their genes become more important, especially if a captive breeding programme forms part of the action plan to save this species. Fortunately, in the context of captive birds, there was some recent good news from Martin Mere. The recently discovered breeding site in Hebei Province is a Provincial-level nature reserve and, despite it being a popular tourist destination in summer due to the extensive lotus ponds, disturbance on the lake itself is relatively low. It is therefore an ideal place to study Baer’s Pochard’s habitat and feeding requirements in order to develop and put in place measures to conserve this species before it’s too late. 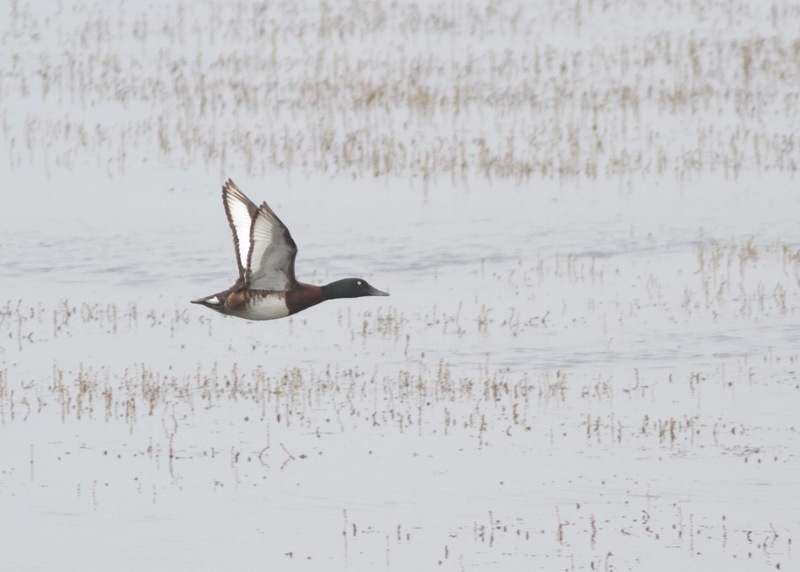 At the East Asian-Australiasian Flyway Partnership (EAAFP) Meeting of Parties in Alaska in June there was agreement to develop an International Species Action Plan for Baer’s Pochard, and a Task Force to lead its implementation. The Action Plan will now be compiled by experts from the main range states of the species, and will identify the priority conservation actions needed at the key breeding and wintering sites and research to fill the most important gaps in knowledge. As is often the case, one of the barriers is a lack of funding. Surprisingly, Baer’s Pochard is still looking for a Species Champion under BirdLife’s Preventing Extinctions Programme… Any takers out there? In the meantime a JustGiving page, set up by BirdLife International, is open to accept donations. Individuals can make an enormous difference to the chances of saving Baer’s Pochard from extinction in the wild. You can read more about the plight of Baer’s Pochard on the East Asian-Australasian Flyway Partnership website and a comprehensive article by WWT and WWF China will appear in the forthcoming issue of Birding Asia, published by the Oriental Bird Club. A PowerPoint guide to identifying Baer’s Pochard is available for download. Many thanks to Richard Hearn, Head of Species Monitoring at WWT, Spike Millington, Chief Executive of the EAAFP, Jim Lawrence and Mike Crosby of BirdLife International, Nial Moores, Director of Birds Korea, and Paul Holt for input to this blog post. Baer’s Pochard was named in 1863 by Gustav Radde after Karl Ernst von Baer (1792-1876), an Estonian Russian scientist who specialized in biology, embryology, geology, meteorology and geography. Interestingly, von Baer was one of Darwin’s most vocal critics. 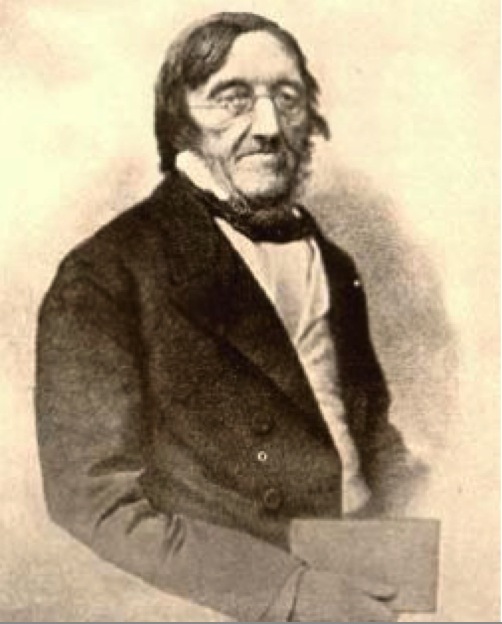 Karl Ernst von Baer, the Estonian-Russian scientist after whom Baer’s Pochard is named. Please contact Birding Beijing if you have any details of additional sightings or anything that adds to the information on this page.